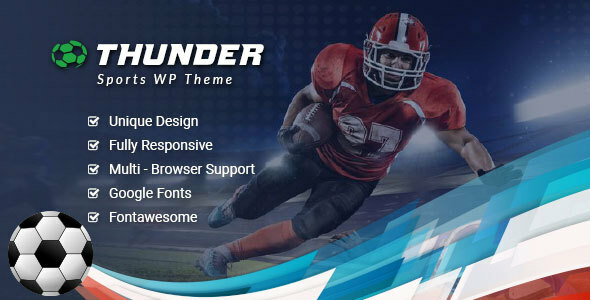 Thunder – sports news blog and magazine WordPress Theme is for football blog, soccer news magazine, sports club website, sports news, sports blog. Soccer & sports WordPress Theme is for basketball, rugby, volleyball, handball, cricket & hockey. Our soccer & sports Theme is also for football club, football news, sports event, event magazine template, sports multipurpose template, football league, sports blog, sports cup, league sport,game, golf, gym, sports events, sports magazines, sports organization, sports online shop store. Soccer & sports WordPress has teams, players, Sports news and fixtures and other sports related features. The template is carefully crafted with very useful homepages and inner pages powered with a lot of features. Advanced Typography Option (manage it from theme settings).